Made By Meg: Will It Work for Me? While I love sewing clothes to my exact specifications, I think you will agree that one of the major downsides to sewing is that you don't get to "try before you buy." You might make a muslin or even sew up a few versions, but all of this takes a considerable amount of work before you can decide if a new style or fabric will work for you. Personally, I have the habit of talking myself into something based on a single flattering example. I convince myself that a style I've seen on Pinterest will be my dream outfit, or that a cute pattern will work for me. I then get all caught up in the details of how to reproduce the look without really stopping to think about how the proportions, drape, or style will suit my tastes. It isn't until I'm most of the way finished (and the point when I am most exhausted and frustrated with my sewing), that I try it on and see that it is all wrong. If this were a dressing room at a store, I would never buy this garment! I think there are probably a number of ways to avoid this problem. The more you sew and think about clothes, the more you figure out what works for you without all the trial and error. To test out new styles, I've also heard of people popping into their favorite store to try them on first before making something up. Lately, however, I've been trying out what I call the pessimist route. Rather than imagining how great a garment will look on me, I try to imagine all the ways it might look wrong. It's not as fun, I know, but it has helped me think of places where I might go wrong and fix it before I even get there. 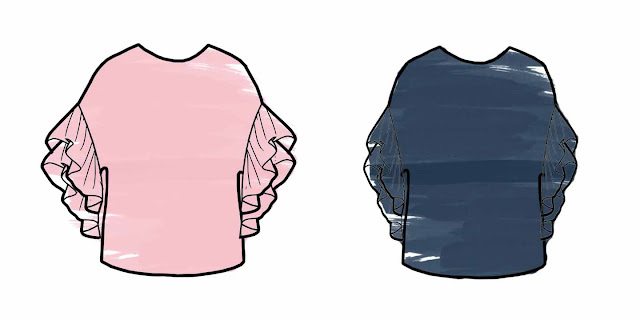 Take the new ruffled sleeve trend. I wasn't that on board with it until I saw a beautiful young woman in Paris wearing a shirt similar to the one I recreated above. It looked stunning! It had a dropped shoulder detail with wide ruffles hanging off the ends in a light shade of pink. It was boxy in a crisp fabric, and wouldn't be that hard to recreate for myself. What beautiful inspiration! But before trying it on myself, I wanted to see what it looked like through pessimist eyes. For one, that color is not great on me. Anything too close to my skin tone and I start to get washed out. Secondly, I'm not so keen on boxy shirts lately, and adding ruffles might make me look like a linebacker. Still, it would be fun to have a shirt with an interesting detail to spice up my main t-shirt and pants look. Above are some modifications I'm considering. A more neutral color such as blue or black would fit better into my wardrobe without washing out my skin. To tone down the volume, it would also be interesting to try this shirt in a soft knit rather than a fabric with a crisp hand. 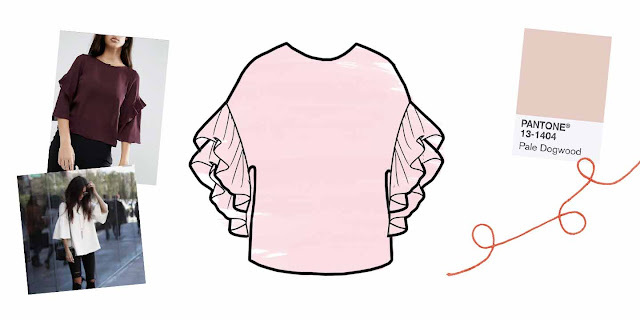 I would have to play around with the length and angle of the ruffles, but this top could work for me. At least it has a better chance now that I've thought through some of the details. What do you do to make sure something will work for you before you take time and effort to sew it up? Wow I never would have thought of that! It's like a real-life sketch-up to play with. Love it! I think your new approach is great, not so much pessimist as pragmatist, and one that is bound to stand you in good stead. I love the inspiration we see all around us, in the city, on runways, in magazines, but it's the editing to make it wearable for our shapes and colour that end up as a successful garment. Bravo the pessimist! Pragmatist - I like it! I'm sure all of us sewists have made the same mistake (more than once more likely!) and even though I'm 62 years old and SHOULD know by now what suits me, what I DO wear (not what I'd LIKE to wear necessarily) and what are absolutely NO DEFININTELY NOTS I still make the mistake of seeing a garment made up online that looks so perfect I decide I must have it and voila! I try on the muslin, look in the mirror and promptly toss the whole works in the bin. No way am I going to ever wear that period. I think I make more garments that I like than don't but I still make mistakes. I think what you said about considering, "Would I try that on in a shop and actually buy it for x amount of $$$?" That helps me a lot. Kathleen, I LOVE this idea. I'm going to have to think of my "event" or benchmark for wearing something. If I'm thinking about sewing 'x', I'll type 'plus size x' into Pinterest and scroll through what pops up. For example, I've been enamored with these loose chambray shirtdresses I've been seeing online but a little voice in the back of my head keeps telling me that's not my silhouette... 90% of the plus size shirtdresses that came up were belted and the ones that weren't looked kind of like mumus. So that tells me something. It also helps to look at BAD examples of the trend you're thinking about sewing and take notes on why it looks bad. (Too stiff fabric, color makes it look like scrubs, etc...) Even if you're not plus size I think doing that search can help you see what something looks like on non-waifs. Too bad there isn't a way to search for pictures of average size people. Sometimes a google images search is good too because Pinterest and Instagram is so curated that you often see only really flattering pics of something at the top. It's deceptive! The nice thing about sewing is that you can make a lot more styles work for you since you can tweak the fit/proportions to you personally. I think that is such a great idea! Try to find images where the style looks bad and learn from the mistakes. Thanks JT!